Preheat oven to 375°F and spray a 9-inch pie plate with cooking spray. Lay the crescent rolls in the plate overlapping and pressing together to seal. Press the dough up the sides of the plate. Bake crust for 10-12 minutes or until golden brown. While crust is baking, brown beef in a skillet and drain. Add 2/3 cup water and seasoning mix and simmer 3-4 minutes or until liquid is gone. Once crust is done, cool for a couple of minutes then begin layering your toppings. First, spread the refried beans in an even layer, followed by the corn, then meat. Sprinkle meat with cheese and return pan to the oven for 3-4 minutes or until cheese is melted. Top with desired toppings such as lettuce, tomato, sour cream, and salsa. No mashed potatoes here. This Mexican version goes beyond tradition with easy-pleasin' flavors that toss together in a snap. One of the first recipes I ever made for a boy was a traditional Shepherd's pie. I remember being in somewhat of a time crunch and was feverishly peeling and dicing potatoes to then continue on to chop, boil, and mash the potatoes before placing the dish in the oven for an even longer amount of time. We sat there and waited patiently while I exercised my conversation skills as it baked. The point is that it was WAY too much work. If only I would have had made this Mexican Shepherd's Pie instead! Start out this pie with a crust made out of Pillsbury Crescent Rolls. The rolls bake up buttery and flaky -- the perfect kind of crust. Of course you could also use a regular pie crust but this happened to be what I had on hand. You're in charge here, so whatever Mexican flavors you love, you can add. You could definitely add a layer of black beans if you wanted or some diced chilies. 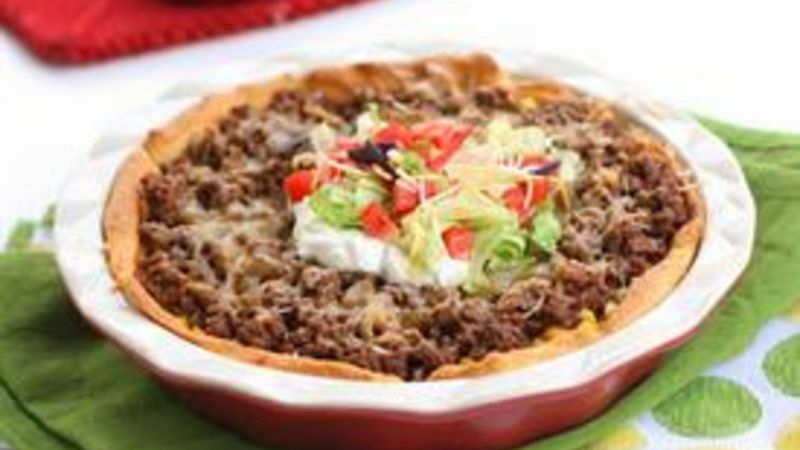 Then top with your favorite toppings: lettuce, tomato, sour cream, or salsa. And there my friends, is a Mexican Shepherd's Pie. How easy is that? What's next? An Italian Shepherd's Pie?